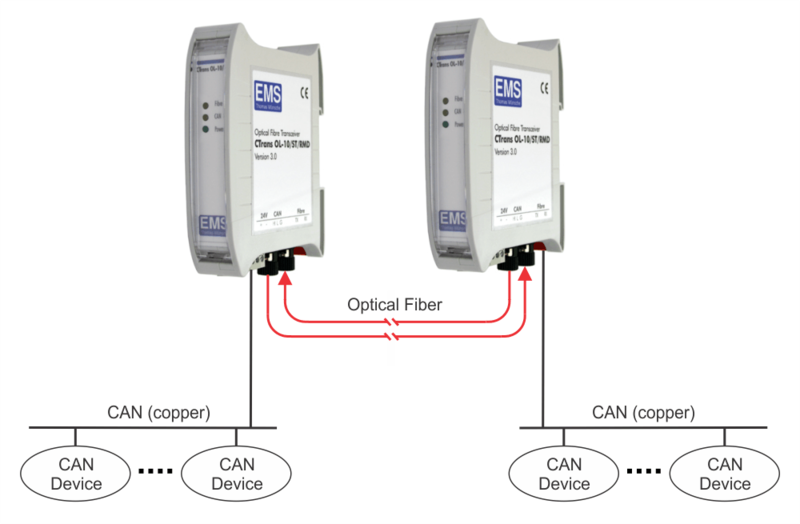 CTrans OL acts as a CANBus converter / transceiver for protocol transparent transmission of CAN signals between copper based sections via an optical fibre. Like repeaters the CTrans OL can be used to build flexible wiring topologies. Star and tree structures as well as stub lines can be realized. The integrated error suppression reduces the influence of faulty segments onto intact sections. For the optical connection cost effective PMMA fibres with pluggable connection and 62,5μm multimode glass fibres with ST connectors are supported. Depending on the type of fiber, a wiring distance up to 1000m can be achieved. Three LEDs on the front panel indicate the status of the internal power and wether a signal is received on the CAN or fiberoptic connection. Need a different optical solution? Not sure if you need fiber optic routers or transceivers? When CTrans OL transceivers and optical fiber are used, the effect of the propagation delay through the transceivers and fiber must be included in the cable length calculation. For a pair of CTrans OL transceivers, the typical and maximum propagation delays is 150ns and 300ns, respectively. Assuming a 5.5ns/m propagation delay for cable, the maximum propagation delay through the transceivers is equivalent to a cable length of roughly 55m. 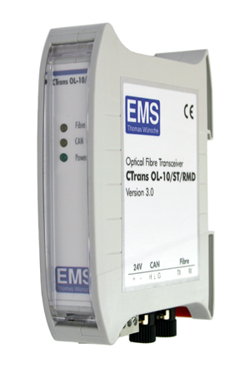 CTrans OL devices include one CAN segment fed to a three pin pluggable terminal. Power is connected at a two pin pluggable terminal. The figure shows the locations of power, CAN and fiber optical connections. Three LEDs on the front panel indicate the status of power, CAN and optical transmissions. Any (also temporary) stress in excess of the limiting values may cause permanent damage on CTrans OL and other connected devices. Exposure to limiting conditions for extended periods may affect the reliability and shorten the life cycle of the device. All values, unless otherwise specified, refer to a supply voltage of 24V and an environmental temperature of 20°C.